In our last installment, we reviewed the general process of preparing for a License Restoration Hearing, and touched upon the general sort of questions that every Hearing Officer will be asking. Now, we’ll turn to the questions that the Client’s particular Hearing Officer is likely to ask, and cover some final details of the preparations for a Hearing. In the example of my Client, from the previous installment, who “froze” at his Hearing, it turned out that the Hearing Officer who heard his Appeal will typically ask someone who claims to attend AA to recite a few of the steps, or give the number of a step and ask the person about it. The larger point here is that each Hearing Officer, in his or her own way, is attempting to explore and evaluate the person’s wholesale lifestyle change, or metamorphosis, and see how sound it really is. They are trying to determine if it really is likely that the alcohol problem of the person Appealing is “likely to remain under control.” Some Hearing Officers seem to be more event and fact based, while others seem to explore more of the “attitude” and tone of a person’s story. One of the phrases I use when I prepare a Client is that they need to be able to “ring true” when questioned by the Hearing Officer. It’s kind of like when a bell is rung, if it has a defect or crack, it will not ring “true.” If the bell is not defective, or damaged, however, then it will ring out clearly. The same really holds true for a person Appealing for Restoration of their License; they need to “ring true” when put to the test. The final part of preparing my Client to testify is what I call the “$64,000 question.” Explaining it in detail here would be out of place, and may not make much sense, but after having spent several hours with my just preparing for the Hearing, the Client will be ready for it. Perhaps it can be best described as an opportunity for the Client, without the restrictions of the question-and-answer format, to be able to tell their story, describe their life-change from then (drinking) to now (sober), and really show their inner commitment to remaining sober. Remember, my job is to present a Client who can “ring true” about abstinence, recovery, sobriety, and the commitment to remain sober. 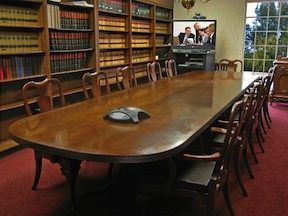 A person Appealing for a License can call witnesses to testify for them, at their Hearing. Personally, and based upon a lot of experience, I do not favor the practice, except in limited circumstances. In the last 20 or so cases that I have handled (and all were successful), I think I called a single witness in only one case. And that’s about average. This really of opens a can of worms. From there, the wife is likely to be asked about her understanding of recovery, and how she thinks consuming alcohol in her husband’s presence while he is trying to remain sober is a good idea. She’ll likely be asked about her knowledge of family support for the husband’s recovery. I think you get the point. That’s not to say witnesses should always be excluded, but, in my experience, a winning case is all neatly packaged up at the time it’s filed. From there, it’s just a matter of preparing the Client for the Hearing. Sometimes, I will submit additional evidence at the Hearing. Because the case is begun by faxing the Request for Hearing, the Substance Abuse Evaluation along with the Toxicology Screen (urine test) and Letters of Support to Lansing, there is little room (or desire, on the part of the DAAD) to receive these additional documents as part of the original package. Any other useful information can be submitted at the Hearing, and will be received into evidence. What constitutes useful additional evidence is hard to explain, and varies from case to case. As an example, lets look at a case Some years back, I had a Client bring in his report card from College. He had enrolled after he became sober, and had maintained a high grade-point average ever since. He explained to the Hearing Officer that, back when he was drinking, he could never have been able to attend, much less perform well, in school. Because of his sobriety, however, he not only found the motivation to enroll in school, but maintain excellent grades, as well. He explained that if he began drinking again, all this effort toward a career would be shot. Another client brought in Community College transcripts. He explained to the Hearing Officer that he enrolled in a certain program after he quit drinking, and had invested all of his own money into tuition. He made the point that this investment for his future was also an investment against his return to drinking. Sometimes, additional AA sign-in sheets, acquired since the case was filed, will be brought in. Other times, certificates or attendance verifications at Counseling or Treatment Programs will be submitted. There really is no end to what can be submitted, as long as it tends to prove the person’s abstinence from alcohol and/or commitment to staying sober. Of course, there comes a point where enough is enough, and it’s the job of the Lawyer to try and make sure the Hearing Officer isn’t overloaded with duplicated information. Likewise, there is generally no need to submit additional evidence. If the case was properly prepared, and that “winning package” was submitted to Lansing to begin the case, there should be nothing missing, and little to nothing that needs to be added. Additional evidence is really a matter of putting the “icing on the cake,” so to speak. It can be useful, but too much can spoil the whole thing. So, to sum up this installment, we have seen that preparing for the Hearing involves first reviewing the stages, or process, of the Hearing itself, as well as the proofs that need to be made, and the standard by which they are evaluated. We next saw that all Hearing Officers will ask a certain group of the same questions, but that each will also have a number of their own. Knowing these things in advance, and how to prepare, can really be helpful to the chances of winning a License Appeal. I pointed out how I find live witnesses to be more of a liability than an asset. Finally, we looked at what additional evidence can be submitted at the Hearing itself, and how not going overboard in that regard is important, as well. At this point, if you’ve read this far, you’ll be glad to know that we’ve finally reached the end of our destination. This series has covered what I believe to be the most important aspects of the License Restoration process. Of course, I’ve had to leave out some details. Certain things are best discussed in the private and privileged confines of the Attorney-Client Relationship. Still, as an overview, I think the articles in this series give a pretty fair picture of the License Restoration process. In the future, there will be other installments about some particular License Restoration issue or practice, probably a “Short Version” review of this series, and I might even toss in a “final thoughts” post as and end-cap to this series. For now, it’s on to other subjects. Thanks for reading along.